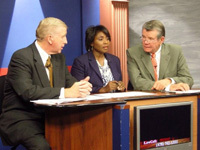 William C. “Bubba” Head, the top-rated DUI lawyer in Georgia, points out the SEVEN most COMMON ERRORS made by citizens during a police investigation and arrest for an alcohol-based DUI less safe charge. Under the GA implied consent law, a person lawfully arrested for drunk driving is to be READ a warning, called an implied consent law notice, that tells the detained driver that he or she is REQUIRED to participate in the post-arrest implied consent test or tests, of face a driver’s license suspension. Many clients come to us and say, “I took the field sobriety tests, and passed all of them. Then, I was arrested and I refused a breathalyzer test.” For purposes of protecting their right to drive, and creating harmful evidence, the Client has done things backwards. A field sobriety test refusal is perfectly fine, and no penalty can be assessed, under Georgia DUI law. 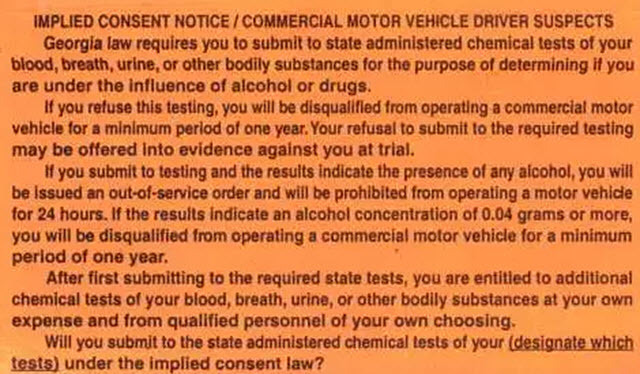 A post-arrest GA implied consent notice, if not agreed to, triggers license suspension, assuming the police officer follows his or her training. Georgia implied consent law, however, calls for a 12-month driver’s license suspension, for any person who is advised on implied consent law, for refusing the breathalyzer test, post-arrest. After refusing breathalyzer test, the driver needs to EITHER file an appeal of the pending administrative license suspension, OR opt for the NEW ignition interlock device, limited permit (IIDLP), for a full 12-month period. ONLY 30 DAYS exist to get this done, so call a DUI lawyer Atlanta ASAP. With a refusal to submit, if the Georgia DDS hearing goes against the person (on no appeal is filed OR interlock installed and “permitted” at Georgia DDS, within the 30-calendar day limit), the driver suffers a TOTAL license suspended for a full year. This is a “hard” suspension, with no work permit. Remaining silent when asked to take a breath test is called a violation of implied consent law. Under Georgia DUI laws, you may think that silence implies consent, but since 2015, the appellate case law says that this is NOT true. In Georgia, a police officer is permitted to write you up for “DUI refusal” and file the 12-month suspension notice if anything other than the work YES comes from you. Mr. Head and the DUI attorneys at his DUI law firm see these 7 common screw-ups by a person being investigated for a Georgia DUI who didn’t know his or her legal rights. Understanding the difference between VOLUNTEERING to be tested, and BEING LEGALLY COMPELLED to submit, under the Georgia implied consent law. AFTER you have said NO to field sobriety test exercises, and before being cuffed (or being told you are under arrest for DUI), an officer MAY ask you, “Are you willing to voluntarily take a breathalyzer at the station, to show me that you are safe to drive?” or similar phrasing. 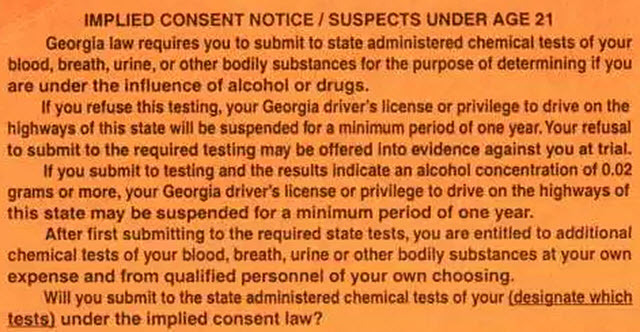 If you say yes, and have not been READ the Georgia implied consent law, this voluntary test for an Intoxilyzer 9000 breathalyzer test or blood alcohol test MAY be admissible against you in the criminal case. 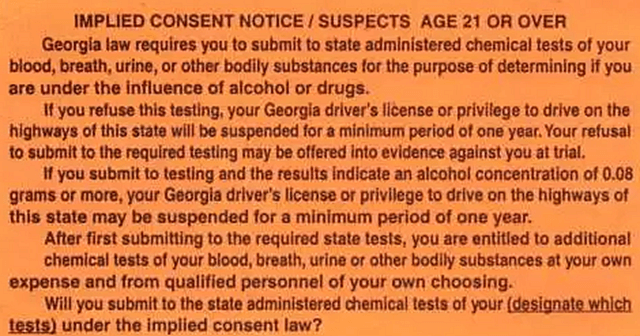 The more likely scenario, however, is that you will be arrested for DUI, and then immediately READ A WARNING OFF AN ORANGE CARD, which is the implied consent notice used in Georgia. Below are the three “notices” for different classifications of drivers. Deciding to not respond to a police officer’s request for the implied consent breath test. Georgia appellate case law indicates that IF a suspended DUI driver refuses to agree (by either NODDING an affirmative answer or saying “YES,” then THIS CONDUCT can be deemed to be a refusal, carrying the same DRACONIAN loss of license for a full year (and other disadvantages) as identified in number 4 above. The bottom line is that NOT taking the state-administered test, as requested by police, can cost you the right to drive. A new Georgia DUI law, HB205 (enacted at the 2016 Legislative Session), allows a driver who has “refused” to comply with Georgia’s implied consent laws to install an ignition interlock device and pay for monthly data downloads for a full year. The NEW interlock OPTION law effect July 1, 2017. Even if a full year of interlock is accepted, the cost of such added equipment is going to be several thousand dollars ($2,000 – $3,500) depending on the sophistication of your vehicle and difficulty of installation. How embarrassing will it be to have to BLOW into a tube to start your car for a full 365 days? 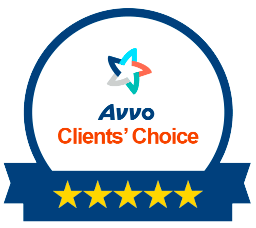 Get your FREE lawyer consultation. Call our law partners NOW, at 404-567-5515 if you need aggressive, professional representation. We will speak to you on the weekend, at night, or even on holidays. 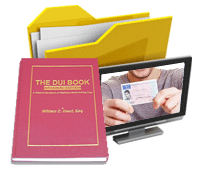 Why hire an attorney for DUI who has no trial experience, or CLOUT with your Court? All of our DUI attorneys know how to beat a DUI in Georgia. 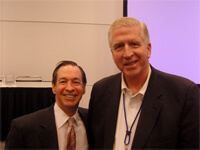 Look up the profiles of Georgia Super lawyers Larry Kohn, Bubba Head and Cory Yager. Our criminal defense attorneys are ready to assist you.